The most essential step in choosing the right heating and cooling system for your home or business is knowing and understanding the types of HVAC units, their functions, and their limitations. If you are planning to install one, a specialist may assist you with your options. 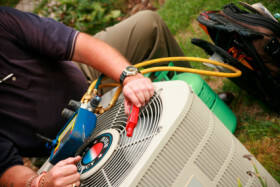 Depending on a number of factors, an HVAC specialist will usually recommend different types of heating and cooling system for various applications. Currently, there are five types of HVAC system, namely: Single Zone, Multiple Zone, Constant Air Volume, Variable Air Volume, and Radiant. This type of system works well for single family homes or apartments. The local cooling coils of a single zone system are utilized to condition air which is supplied through an air delivery system. To make sure there are options for free heat and cooling recovery and minimum fresh air supply, air delivery can be set up. You can model this system with or without outside air. If you prefer not to include outside air in the system, the Mechanical Ventilation On option should be unchecked. Radiant, or the fan coil system, makes use of a 4-pipe fan coil unit that runs hot or cold water through metal pipes to heat or cool the air prior to releasing it into the room. Radiant systems are made up of a fan, an outdoor air mixer, a cooling coil, and a heating coil. Unlike the single zone system, radiant units cannot incorporate economisers. This type of HVAC system is typically used in older buildings and homes. Multiple zone HVAC systems are ideal for business buildings or multi-story apartments. These systems offer heating and cooling to several areas of a building. Similar to single zone systems, air delivery is adjustable and option for economisers is available. Although this system has multiple zones, there are only one specified control zone for all. What’s great about this system is that each zone has a thermostat and can have different regulated temperature. Variable air volume systems allow you to control the amount of heated or cooled air delivered to each zone. This system type also has the option to preheat air, reset air temperature, and distribute air in different ways, ensuring that each zone has minimum fresh air delivery. Additionally, it has option to provide heat recovery and set minimum flow fraction. Variable air volume systems are common picks for commercial retail buildings. This HVAC system is designed to offer a constant volume of airflow to each zone. It is quite similar to multiple zone units. The difference is that CAV provides more control to a single hub. By switching the unit “off” or “on”, CAV can manipulate and regulate temperatures of the various zones. CAV HVAC systems are mostly used in retail and commercial buildings with large structures. Visit Arizona Accurate’s website or call us to speak with an HVAC specialist to determine which system is best for your business or home.